An older Clementine—that we control—with the same short haircut. Good girl, Clementine. You learned from the best. If you played the first season you'll recognize some key locations and recall some really horrific memories. 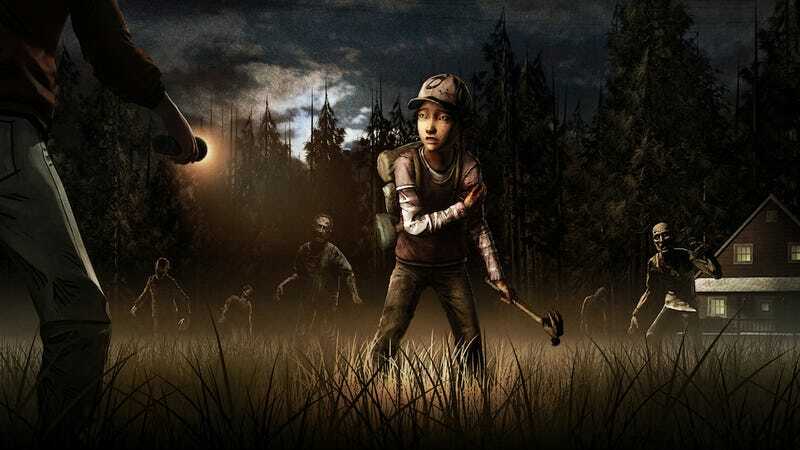 The Walking Dead: Season Two – A Telltale Games Series will continue the story of Clementine, a young girl orphaned at the outset of the undead apocalypse, now left to her own devices to seek safety and survive in a world gone mad. Now assuming the role of an ordinary child, players will struggle to outwit both the dead and the living in situations that will test their morals and control the flow of the story through their decisions and actions. Season Two, like the first season, will be a five-part episodic series set to start some time later this year and end some time in 2014. It'll cost $25 for the whole season unless you pre-order for a 10% discount (that's $22.49). It'll come out for PC/Mac, "home consoles" (guessing that means current-gen Xbox 360 and PS3 and potentially next-gen to follow) and iOS. The PlayStation blog mentions a Vita release, too. Telltale mentioned there will be other platform announcements soon (next-gen?). We're light on details otherwise, but the one many of us have been hanging on was whether or not Clementine would be the central character in the second part of Telltale's fantastic narrative experience. Hopefully Season Two will live up to the harsh conditions and decisions the first threw at us. Looks like Clementine's going to make some new...friends.